Is the leader the reason why there’s low trust on the team? The leader of a team and of the entire organization sets the tone for the group’s culture and level of trust. 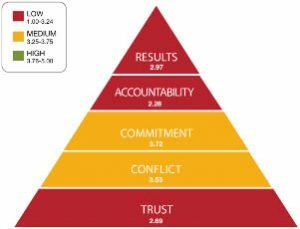 If you’ve given the Five Behaviors of a Cohesive Team assessment to a team that scored low in trust it might be a good time to look at the leader. A leader who doesn’t trust his or her team can discourage trust among the team members, too. Before you begin work with a team to improve their trust levels, you might want to look at the organization’s culture and at its leaders. From leaders who operate from fear, to those who disclose too much, the level of distrust in an organization and its work groups often is traceable right back to the top. Leaders are often unaware of how they influence their teams and organizational culture by being a model for appropriate behaviors. Here are five behavioral issues a coach can explore with a leader to increase his or her own level of trust, thereby influencing the trust levels of the team. How well does the leader do with these behaviors? Many people think of leaders as the people who have all the answers, who are on top of everything happening around them and in total control of their surroundings. Leaders might fear appearing incompetent, underachieving, and worry about political attacks from rivals. That’s a lot of pressure. 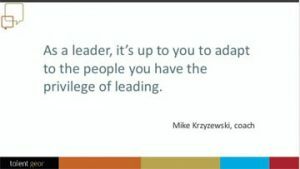 As Bill George writes in his book Discover Your True North, “As we have learned from working with many leaders, the hardest person you will ever have to lead is yourself.” Use the Everything DiSC Work of Leaders profile to give leaders insight into their own leadership behaviors and priorities. Leaders need to know what drives them, what they value, and be willing to share that knowledge with others. 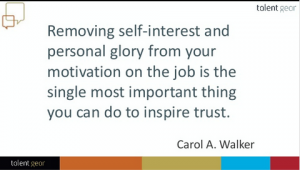 Leaders who present themselves authentically have taken a long stride in their journey toward inspiring trust on their teams. Leaders can be good at insisting that they espouse values such as fair treatment, transparency of decisions and budgets, promotion and hiring in accordance to high standards, and yet display something different based on their actions. Employees and staff will eventually look beyond words to make their judgments. Good leaders are readable and consistent in their behaviors. This establishes what Patrick Lencioni calls predictive trust—you’ll do what you say you’ll do. When the leader is presented with an opposing opinion, those around him have a good idea of how he’ll react. Even poor but consistent behavior is easier on a team, than capricious behavior. To really build trust leaders need to move beyond predictive trust to vulnerability-based trust, meaning being open and honest with others. 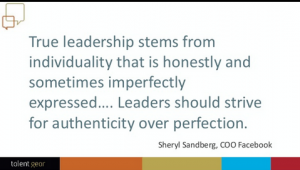 Encourage leaders to be honest with themselves about their values. How much are they motivated by a desire for power or influence? What type of leader do they want to be? How do their values help them move the team toward results? Are their actions grounded in their values? Challenge them to prove their commitment to what they say they value. A 360 review can help leaders see through their own blind spots. It can help them see how their team views their actions. Everything DiSC 363 for Leaders makes this type of review more comfortable for leaders or teams with low trust. The raters are allowed to make comments only by choosing from a list of possible responses. 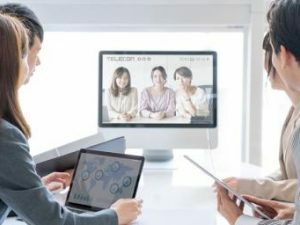 So the leaders might receive a comment like “He/she sometimes doesn’t give consideration to all sides of an issue” but never “He’s a jerk and who just likes to hear himself talk.” A good coach can review results and help a leader with this feedback in order to align actions with values. Leaders need to know that they are responsible for their teams. If the team fails, so will they. This can trigger a leader’s desire to micromanage to ensure success, but micromanagement is a strong signal of distrust. 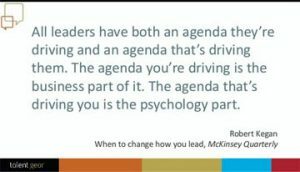 Leaders also need to know that they have some time to gain alignment around their vision and see results. The pressure of leadership is easier to handle if leaders have built their position upon core values and if they’ve taken the time to build alignment around vision and the team’s goals. Leaders need to set a team norm that accepts acknowledgement of failures or limitations and makes it OK to ask for assistance. They need to model this by admitting their own mistakes and by apologizing or fixing the issue. Leaders who are comfortable with vulnerabilities want to hear from their teams and allow for disagreements and questions before making decisions affecting the team. They know that they are more trustworthy when they follow a fair process and hear from all sides, admitting that they don’t have the facts, experience, and knowledge that the entire team has. A leader with vulnerabilities is stronger than one who insists on having none. Moving from management to leadership can be difficult. New leaders are no longer directing work, but providing a vision and obtaining resources and removing barriers. They’re responsible for building the competencies of their team and inspiring more than administering. They need to seek collaboration instead of compliance. How do leaders prove to the teams that they are trusted? They listen, know each member as an individual, coach teams through difficulties, share their own knowledge, remove roadblocks, and celebrate team successes. They solicit honest feedback, giving it as well as accepting it. They encourage civil debate. They make their expectations clear and then step back and allow team members to take their own paths. They allow for learning from failures. They make the establishment of trust a high priority. Coaches, you can help leaders practice these behaviors and hold the leaders accountable for contrary behaviors. If a leader trusts his team, he’ll back them up on their journey and take pride in their successes. He’ll acknowledge individual efforts and the team. Recognition shows that the leader doesn’t take his team for granted or is taking all the credit for results. Knowing the DiSC styles of each team member will make it possible for leaders to recognize them in a way they most value. Trusted leaders also take care in how they assign credit for work. Often whomever speaks most confidently, loudly or persistently about an idea or results gets more credit for the idea or result. However people who are more introverted (or on the S and C DiSC quadrants), female or from a less individualist culture might actually deserve more of the credit and recognition. Leaders who consistently reward the wrong person can reduce the amount of trust on the team. Trust isn’t an attribute that can be ignored. Trust in leaders can easily slip or be lost during times of upheaval and change. Leaders going through personal challenges can be so focused on their needs that they neglect their teams. A leader seeking a promotion can sometimes lose focus on their core values. Leadership coaches need to be watchful for this and help leaders take care of themselves and return to a focus on values. Good leaders aren’t afraid to listen to their teams, looking for signs of an erosion of trust in their leadership and in them as people. They aren’t afraid of asking for help and working with a coach to build their leadership skills. Good coaches encourage leaders to continually examine how they affect their teams. After working with a leader low in trust, coaches can return to the team and ask them to take a Five Behaviors of a Cohesive Team Progress Report. Trust scores should go up as trust in the leader improves. Then the team’s work can continue building trust of each other.